If not a field marshal’s baton, what did Napoleon’s soldiers really carry in their backpacks? Napoleon’s Infantry Handbook is an essential reference guide, filled with fascinating detail on the training, tactics, equipment, service and administration of Napoleon’s infantry regiments. Based on contemporary training manuals, regulations and orders, Napoleon’s Infantry Handbook details the everyday routines and practices which governed the imperial army up to the Battle of Waterloo and made it one of history’s most formidable military machines. Through years of research, Terry Crowdy has amassed a huge wealth of information on every aspect of the infantryman’s existence, from weapons drill and maintenance, uniform regulations, pay, diet, cooking regulations, hygiene and latrine digging, medical care, burial of the dead, how to apply for leave and so on. This remarkable book fills in the gaps left by campaign histories and even eyewitness memoirs, which often omit such details. This book doesn’t merely recount what Napoleon’s armies did, it explains how they did it. 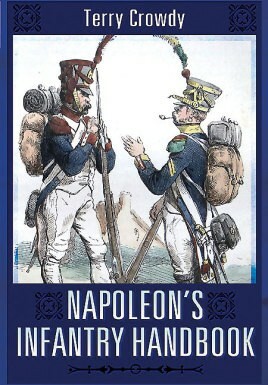 The result is a unique guide to the everyday life of Napoleon’s infantry soldiers. T.E. CROWDY is a well-established author specializing in the Napoleonic Wars and espionage history. Known for his lively narrative and attention to detail, Crowdy’s research on Marengo has won awards with the respected Napoleon Series Writing Contest. Marengo is the product of twenty years of research and visits to the battlefield. The author is the Fire and Emergency Planning Adviser for Historic Royal Palaces. He lives in Rainham, Kent.